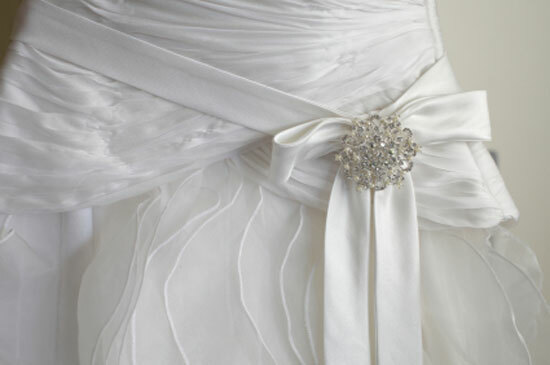 Renting a wedding dress is an excellent choice for anyone trying to save money on their wedding expenses. It is also a great choice for anyone who wants to wear a designer dress that is out of their price range. It is also perfect for the bride who just doesn’t want to spend an extra ordinate amount of money on a dress that will be worn just once. In fact for anyone who is into living a green lifestyle, renting a wedding dress is the way to go, as it is reused, rather than taking up space before eventually heading to a landfill. If you want to rent a wedding dress for your big day the first thing you will need to do is locate a wedding dress rental company. In many big cities, and especially in areas known for destination weddings, you should be able to find wedding dress rental companies easily. Typically you will need to make an appointment in order to try on dresses. If you have a picture of a dream dress that you can bring along, it will greatly help the professionals who are working with you and potentially save you a lot of time. Even though men have traditionally rented their tux for getting married, renting a wedding gown is a relatively new idea. Therefore there are not a ton of stores out there which offer this option. There is also no industry standard for such arrangements yet either. Therefore you must read the terms and conditions of the rental carefully in order to make sure you are not costing yourself extra money. Here are some of the things to look out for. Check the duration of the dress rental. If you are renting a dress and going away for the ceremony, you may not be able to bring it back in time. Most gown rental companies include cleaning of the dress prior to and following use in the price of the rental. However, be sure that is indeed the case. In regards to alterations, rules differ widely. Some companies forbid alterations completely; others provide alterations free of charge, while others allow you to pay for your own alterations if needed, but only through their chosen tailor. Whatever the policy be sure to abide by it or you may have a huge bill on your hands. When you are looking for a dress to rent, remember the accessories. While some companies offer wedding packages, complete with shoes, purse, petticoats if necessary, a veil and more, others will charge piece by piece. Don’t invest in items you will never wear again if you are renting a dress. However, you may want to buy your own shoes, as white shoes are always practical. There are also online options for renting wedding dresses. Some companies have an inventory of dresses that you can choose from. Other sites are forums that provide an advertising space for individuals who want to rent their own dresses. If you choose to go this route, choose a dress that is not too far away geographically to save on shipping costs. Read the agreement carefully as it will differ from renter to renter. Cut your wedding costs, while making a wise choice for the environment, by opting to rent a wedding dress. Your special day will be just as special and you’ll be just as beautiful.